John Hill shared his Journey with us earlier this year. Read it here. A graduation address by Father Frank Brennan SJ AO, friend of St Vincent's and guest speaker last month at a UNSW graduation ceremony for the Faculty of Law and the Institute of Environmental Studies, during which he received an Honorary Doctorate of Laws. Last December, I was in New Orleans, that most enchanting of southern US cities. Staying at Loyola University, I enjoyed the charming southern hospitality not only in the piano bars and at the university but also on the tramcars and in the streets, which had been invaded by football fans from all over the United States for one of the big college football finals. Since then, the levee banks of New Orleans have been swept away by Hurricane Katrina. We have all been reminded how fragile our hold on nature is; and just as fragile is our hold on morality, law and order. Our usual consolation as we go about our daily lives is that it could never happen to us. I daresay many residents of New Orleans thought the same thing. Congratulating those of you graduating with Masters of Environmental Management, I urge you to do all you can to maintain the levee banks of our cities and continent so that we might live securely in our land for generations to come. I also urge you to speak up when you find government or developers proceeding with developments which are doing violence to our relationship with the land and with nature. Congratulating those graduating in law, I am aware that some of you will not practise as lawyers in courts or in law firms. But you are now all citizens who are better armed to scrutinize laws and policies which place at risk the moral and legal levee banks of our social life together. One levee bank now used by all other equivalent societies is a bill of rights. Without a bill of rights, we Australians need to be more vigilant as our national government with control of the Senate, with tighter party discipline than enforced in other democracies, and with a reduced sympathy for the scrutiny of international bodies, tries to deal with the threats to society in a post-September 11 world while maintaining appropriate civil liberties. You will recall that the High Court of Australia has already said that it is powerless to reel in government even if it wants to keep stateless asylum seekers in detention for life without court order or supervision. "My three hours in the detention centre on the evening of Good Friday convinced me that it was time to put the message to you very plainly despite its public unpopularity and despite your government's immunity to moral outrage: 'Minister, this is no place for kids.' When children end up in the sterile zone against the razor wire with tear gas and batons around them in Australia, it is time for all parties including the Commonwealth Government to stop blaming others and to effect policy changes so that it can never happen again." In the end, the government did apologise to the mother of the seven-year-old boy whose bruises I had seen after he had been hit with a baton and tear gas. And finally government has decided that a detention centre is no place for kids. You law graduates have been privileged to attend one of the great law schools of the nation. You are well positioned to live fulfilling professional lives dedicated to law and justice. We need your vigilance and eye for the victim and for the decision maker. "A set of scales can tell you that an ounce of silver has the same weight as an ounce of sand. The scales cannot tell you whether an ounce of silver is more valuable than an ounce of sand; you need some other standard of measurement for that purpose." So may all you graduates in law and environmental studies find the right balance in your personal and professional lives, and may Australia be the fairer and more secure as a result of your labours. Without you, our scales of justice will be tilted, laden with sand; and our levee banks too will be in jeopardy. A few Sundays ago the church bulletin reassured the Community that "assistant parish priest" Sudla was performing good works in the Philippines - see Sudla's whereabouts. It now looks as though this may have been just another Neocat lie, an attempt to deny that Sudla may have fled the country to escape a Church Tribunal hearing into his behaviour. The Church Mouse has it on very good authority that Sudla is unlikely to be returning to Australia, that he may have left the ministry and is no longer a priest. Will more factories producing theologically, pastorally and socially challenged clergy like those suffered by the St Vincent's community save the Church? See CathNews article Pope blesses cornerstone of new Sydney Seminary. What is wrong with the men who control our Church? As from this week the presbytery will be located at 108 Great Buckingham St, Redfern. Saturday evening Mass will continue to be celebrated in the presbytery. This is the only legitimate Parish Mass on Saturday evening. Neither I nor the Cardinal have given permission for any other parish Mass on Saturday evening. The small number of long-time parishioners who have tried the "only legitimate" option found the experience disturbing and could not, in good faith, continue. A Neocat-free alternative has been in effect more or less since Prindiville first denied the Community the use of its Church for the Saturday evening Mass. See Aboriginal Medical Service to the rescue. All are welcome to participate in the Community Mass celebrated every Saturday at 6:00pm at the rear of the Aboriginal Medical Service premises next to the Church which the Neocats refuse to open. As if the Neocats aren't bad enough, Sydney is about to be subjected to an even more dubious bunch of Catholic crazies. The Church Mouse has it on good authority that the Legionaries of Christ are about to descend upon the inner western Sydney parish of Stanmore. George, what the hell do you think you're doing to us? Take a look at The Rick A. Ross Institute's extensive and disturbing set of references on this group. The following excerpt and photograph were taken from a special colour feature produced courtesy of The Record, Western Australia's Catholic newspaper. The image is fascinating. 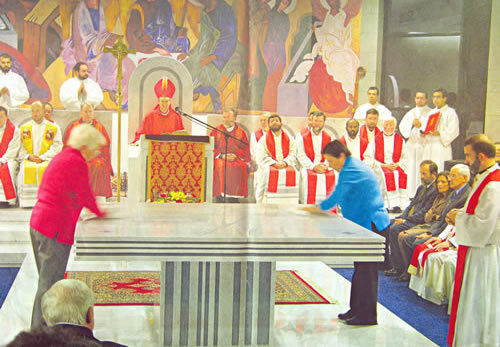 The women are, of course, in their rightful place wiping down the altar, with the priests carefully supervising. The women, however, are wearing the pants; and guess who are wearing the pretty frocks? A spectacular ceremony marked the completion of the new chapel at Redemptoris Mater Archdiocesan Missionary Seminary in Morley [Western Australia] on June 28. Archbishop Barry Hickey presided over the dedication and opening with Auxilary Bishop Donald Sproxton and 40 priests who were present for the occasion. Redemptoris Mater is the missionary seminary of the Archdiocese; seminarians follow the Neocatechumenal Way for their own faith formation. In addition to parish duties, priests and seminarians of the Way work with communities in the parishes of St Mary's Cathedral, Mirrabooka, Kelmscott, Rockingham, Whitfords and Mosman Park. The completion of the Chapel is the third completion of a new building since the inauguration of the Seminary in 1994. [Rector] Fr Moore said the striking beauty of the Chapel and its various features help the seminarians and faithful who celebrate there to participate with zeal. The clear glass door to the Chapel has been etched by sandblasting with the scene of the Annunciation. Fr Moore said this is because people only come to the Church through hearing an announcement of Jesus Christ or through personal witness. “The doors and also the windows are full-length glass so that the Church can see the suffering of the people of the world and bring to them the light of the love of Jesus Christ in the Church,” Fr Moore said. The altar, in the centre of the Chapel is designed like a table, “because it is the table of the Eucharist, where we participate in the banquet of the body and blood of Jesus Christ,” he said. The lectern is also designed like a table where the word of God is proclaimed. “This is the same word that the angel proclaimed to Mary Magdalene that Christ is risen from the dead. This is reflected also in the icon at the back,” he said. The chair, Fr Moore continued, represents the head, while the lectern is symbolic of the mouth of the body of the risen Christ. The Church Mouse can't resist taking this pseudo-theological inanity a step further and ask whether the new chapel has a spire or steeple, what it might represent, and whether or not size matters? Fr. Dennis is spending some time in the Philippines doing missionary work and to be near his family who need his help. In the meantime, Fr Nick will be helping in the parish.